I never knew what a "Lolo" looked like. I was born at the other end of the world, far from his Tibetan birthplace and in my family we spoke high Tibetan. I knew the term Loba, which some Tibetans used to refer to American Indians (Amirika'i klopa) - whether it meant the same in my grandpa’s dialect? That’s what I subconsciously assumed until I finally encountered real Lolos face to face on an adventurous journey through the southeastern Tibetan frontier as a young adult. 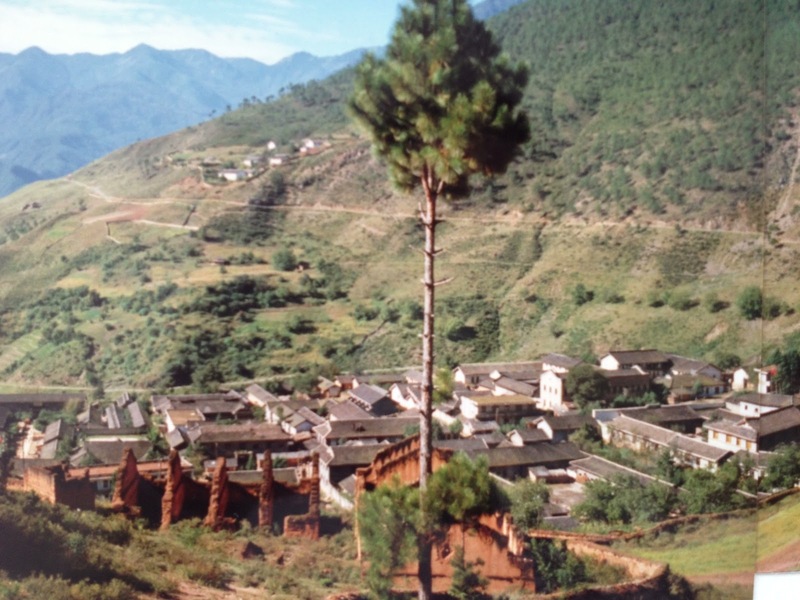 It all began in a town called Ninglang along the southeastern section of the Sino-Tibetan borderland. We found ourselves a driver and car and began the journey up north. 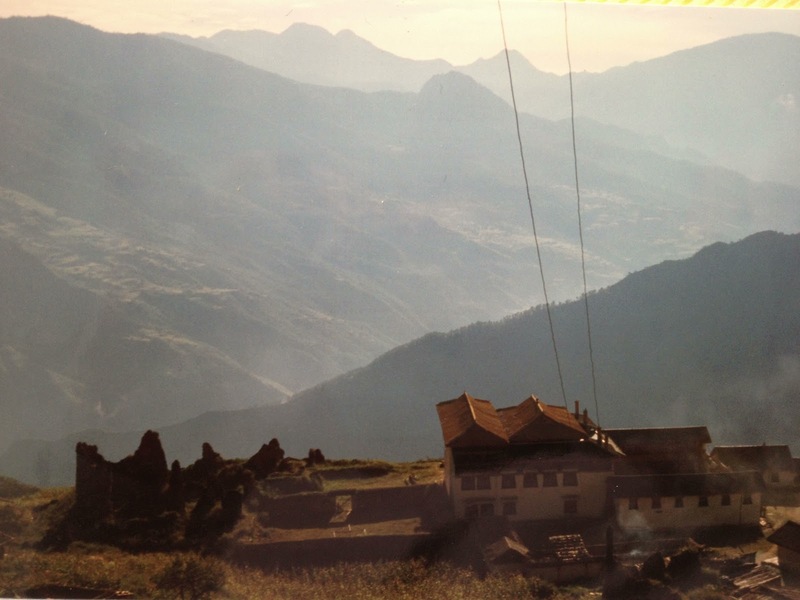 Our destination was Mili, a remote Tibetan area we knew from old travel accounts. I wanted to see for myself the remnants of the palace of the former "lama-king" and take a look at his fabled kingdom which I only knew from old photographs published in the National Geographic ages ago. A few miles outside the County seat, we saw two local women hitchhiking. Our Beijing Jeep was half-empty, the road was long, and who knew when the next public bus would pass by. So in came two women wearing huge square hats that looked like black kites ready for take-off. Their pleated black skirts were dusty and their gigantic, shapeless brown cloaks smelled of smoke. They also wore huge creoles. After the women got off at the first hamlet, we had to air the car. The Tibetan driver said, the ladies were "Yizu" (Khotso yidzu red), who lived in the surrounding mountains growing potatoes, corn and poppy which they also smoked. But "Yizu" was clearly not a Tibetan word. The very sound was revealing. Khotso yidzu red was a total ra-ma-lug sentence: Neither fish nor flesh, a stylistic faux pas, worse than messed up zhesa or honourific language. I pestered the driver what they call them in Tibetan. After a while he reluctantly said Lolo, only to instruct me the next second not to say the word out loud because it was pejorative and we were on their turf. He bent over and said in a low voice: "Lolo means thief, so we are not supposed to use that expression. Since liberation we have to say Yizu." Obviously only people who were not "liberated" like my grandpa and myself continued to ignorantly use "Lolo"! It's not a Tibetan term either for that matter but at least it sounded like one. The road was getting narrower and steeper and we advanced at a snail's pace. Suddenly there was a stretched rope across the lane blocking our advance. How odd, in the middle of the mountains! Then men emerged left and right from the road and said we had to pay a toll otherwise they wouldn't let us pass. To my untrained eye they looked like the average Sichuanese road workers one can see in many places in Kham. But the driver said they were Yizu or Yi people. After negotiating with them for a while, he paid them a sum so they would let us continue our journey. Later that day we had to cross a broad creek. The driver said the water is shallow enough to drive through. There was no bridge in sight anyway, only a few houses on both sides. Like in an adventure film our car got stuck in the middle of the creek with the water level high enough to enter the Jeep. We took off our shoes and socks, pulled up our pants and grabbed our backpacks, wading to the other side. Then we went to the first house asking for help. It cost us again but the Yi eventually helped us pull the car out of the water. After this incident, we kept having problems with the car. Somehow the steering system was impaired and the breaks didn't seem to work properly either. When we reached Mili at Lhakhang it was already dark. We urged the driver to get the car properly serviced the next day, while we were going to explore this fabled "Lama-kingdom". Early in the morning we climbed up to Mili Gonchen, the great monastery and palace of the former ruler, the "Lama-king". Historically Mili must have been a Tibetan El Dorado with mining, gold planning, and generally gold constituting a large part of the kingdom's budget. The Mili king was also on friendly terms with the neighbouring Konkaling bandits buying weapons from them and granting them a safe passage after their pillaging tours through the borderlands. Eventually, he was killed by the Nationalists in 1934 in a war over gold prospecting rights. Since the Mili kings were Gelugpa patriarchs, they had no direct heirs and usually a nephew would succeed. But we couldn't find out whether the ruler, killed in 1934, was succeeded by a male relative and whether there was person in Mili today who continued this position in one way or another. "Mili Gonchen", the great monastery of Mili; photographed up the hill. 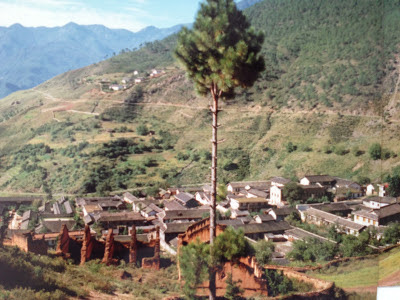 After the Communists took control, Mili was made a County of the Liangshan Autonomous Prefecture of the Yi, Sichuan Province. The Miliwas are now governed by "Lolos", so to speak. What would my grandpa have said to this? From what I gather, the Tibetans in the region to this day consider themselves on a higher level of civilization than the Yi. So how well are the Tibetans of Mili able to put through their "nationality-specific" concerns such as language under a Yi Prefecture, I wonder? In spite of the turbulent history and the ruthless exploitation of Mili's huge natural reserves, most notably forests, it was still a beautiful place. Like in other Tibetan places, the Chinese have been systematically taking away anything that they could turn into money. What they considered useless, such as places of worship, they destroyed. But despite the vandalism, the exploitation and the destruction, I found a land that was majestic, serene and pure. The wounds lie deeper than a casual visitor would be able to recognise. There weren't any monks to be seen back when we visited and some parts of the monastery were still in ruins but a recent music video shows Mili Gonchen completely rebuilt with an active Sangha and the singer is shown going for mchod mjal. Singers are often role models for young Tibetans. 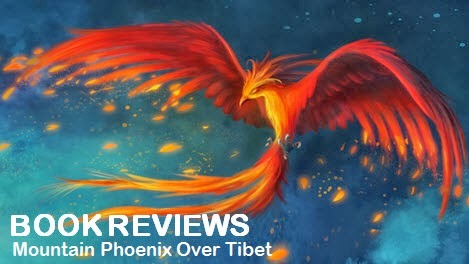 When one of them is shown performing a primordially Tibetan act such as paying respect to the Dharma and its representations, it may give people's resilience a boost in the face of Chinese cultural and political pressure. Praise to the grand monastery of Mili as a haven of comfort and happiness. The first half of the song is sung in Tibetan. The second half is in Chinese. It’s remarkable that people rebuilt the monastery and monks are ordained again. After all, in the old days a grand monastery like Mili demanded ample corvée or ulag and historically the subjects were said to be extremely poor with few rights. The new rulers did their very best for their part to incite people against religious institutions and Buddhist dignitaries. Yet the first visible thing people did when they regained some freedom was to rebuild the monasteries. Maybe the common folks of old have always understood Dharma better than many of their so-called "educated" observers including myself. The reverence and devotion has never been about the monastery or a Buddhist dignitary but what they stood for: The teaching of the Buddha. People knew all along it is precious and must be protected at any cost. Spectacular mountain views greeted us when we left Mili descending on the winding road to Yongning. We finally reached the plains at dusk when our Beijing Jeep totally conked out. Neither the breaks nor the steering wheel were responding. We drove straight into a tree and the car toppled over into the roadside ditch. It was the shock of a lifetime. Had this happened a few hours earlier up in the mountains of Mili, it would have been our last hour. The car would have plunged into a gaping abyss and our time on earth would have been up. Nobody got injured but the thought gripped us at the marrow. Luckily the accident happened at the entrance of a small hamlet. As it was getting dark, we crawled out of the car, collected our belongings and found shelter at a near-by farmhouse where we spent the night. We reached Yongning hitchhiking with local farmer on a rattling motor rickshaw the next day. Located at a scenic lake called Luguhu, the place surprisingly had a functioning Tibetan Buddhist monastery. 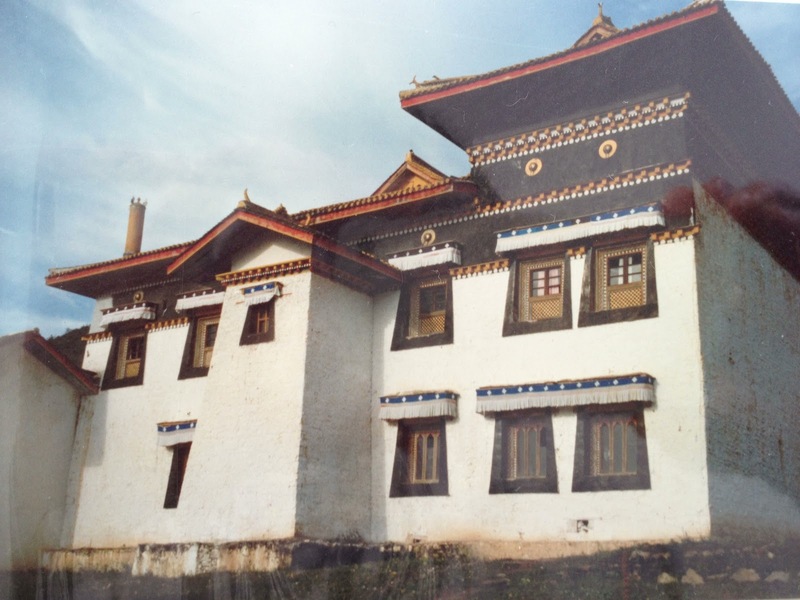 It was built in Sino-Tibetan style with monks who spoke Tibetan. We couldn't tell whether they were real Tibetans or assimilated Mosos who converted to Buddhism. 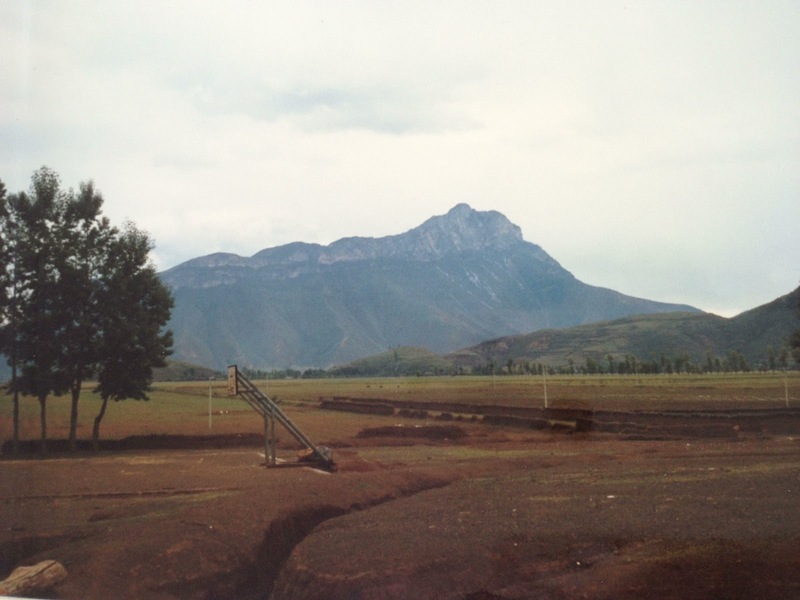 The Moso were the dominant ethnic group in this area. Unlike the Yi, the Moso felt much closer. 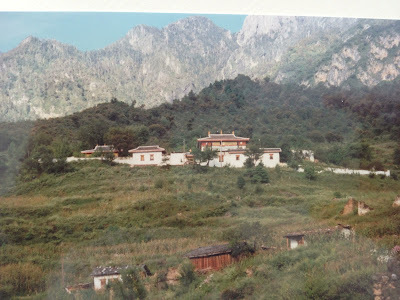 At the monastery it became clear, that the town called Yongning on official maps was what the Tibetans refer to as Thalam (mtha' lam) and lake Luguhu was something like Latha Tso in our language. The monastery's official Tibetan name was Thalam Trame Gompa. It turned out to be another Gelugpa outpost affiliated with the three Densa in Lhasa. 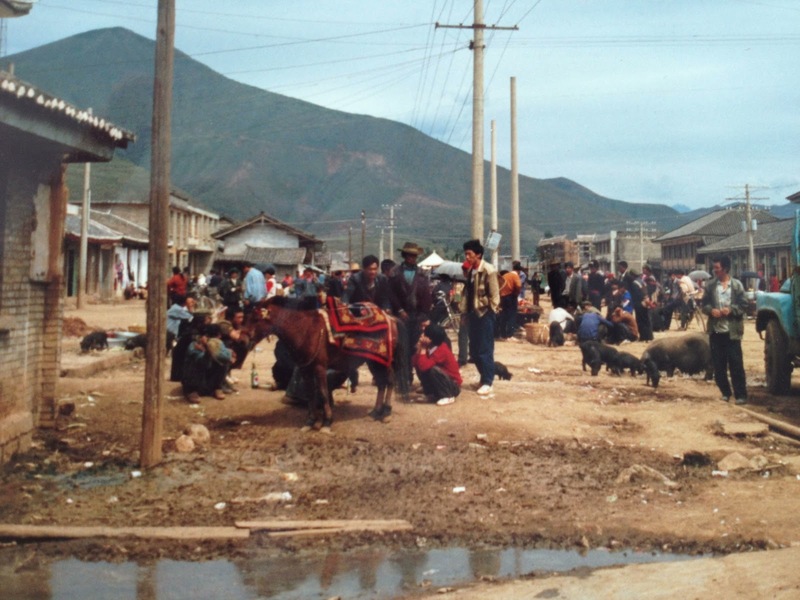 In the old days, you could find monks in Sera, Drepung and Ganden that came from border areas like Thalam. Since "liberation" none of the Tibetan Buddhist monks from the outlying Tibetan are allowed to study at the three great monastic universities in Lhasa. Only Lord Buddha knows how they manage to reach the required level of studies. Some escape to the Buddhist institutions in India to complete their religious studies. Upon return to their home monasteries in Tibet however, they are met with suspicion and are often given a hard time to teach. We also learned from the monks in Thalam that the beautifully curved cordillera that hugged the lake on one side was Thalam Senge Karmo or "the white snowlion of Thalam", considered the local protector deity or yullha of the region. Now Shidag or Yullha are about as kosher Tibetan as it can get. Unlike Buddhism, which is imported, the belief in local protector deities is an authentic Tibetan creation. Every place in Tibet proper had its local protector deity. To witness this broad outreach of Tibetan culture was simply amazing. 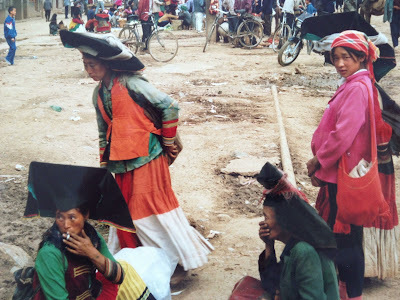 The last stop on our great journey was Lijiang, the centre of the Naxi people whom the Tibetans call Jang and whose city they call Jang Sadam. The place is mentioned in the Gesar epic, so many Tibetans have heard about it. I don't know though whether they connect it with modern-day Lijiang. Of all the ethnic groups on Tibet's southeastern border perhaps the one the Tibetans feel closest to or least distant from are the Tibeto-Burman Naxi. Mixed marriages between the two groups occurred frequently in the old days, the common pattern being a Tibetan trader husband with a Naxi wife. Lijiang was an important town in the tea trade between Tibet and China. We can also read in Bapa Phuntsog Wangyal biography written by Goldstein that when the Nationalists were looking for Communists like him, he went into hiding to Lijiang where he had a relative that was married to a Naxi noblewoman. 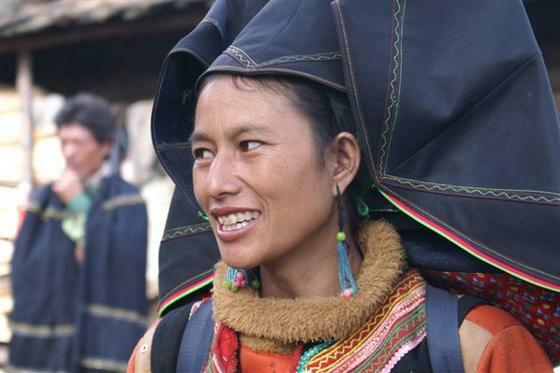 Perhaps intermarriage was also easy because many Naxi used to practice what looks like a form of Bon. Their religion is officially called "Dongba" which is another Chinese linguistic corruption and conceptual inadequacy based on the Tibetan ston pa ("Buddha"). The Tibetan original is used to refer to Buddha Shakyamuni (Tonpa Shakyathupa) but also to Tonpa Sherab, the founder of Bon, whom the Chinese inconsistently render as Dingbuo Shiluo. - My hair is beginning to stand on end again. Welcome to Babylon! Lijiang’s Old Town was touristic already when we visited years ago. If you go there today you'll probably be put off at the hordes of noisy Chinese tourists clogging the Old Town with its lovely creeks and cozy arcades. The town seems to get more and more crowded every year. If you are interested in Naxi culture you could attend a concert of the famous Naxi orchestra which was founded in the early 1980s to save Naxi culture from extinction. But don't expect too much. Ancient Naxi music seems to consist mainly of "ancient" musicians in uniforms made of Chinese brocade and playing musical instruments that sound Chinese. The pieces are said to date back to the Yuan dynasty. Whatever, a Naxi element in the music is hard to detect. I suspect it's more of a tourist cash machine than genuine Naxi culture. Or Naxi culture is the same as mainstream Chinese? Only the Naxi know. We didn't dwell in the commercialized Old Town and explored the surrounding area on bicycle which was lovely. There were several Karma Kagyu monasteries in the Lijiang plains we visited. 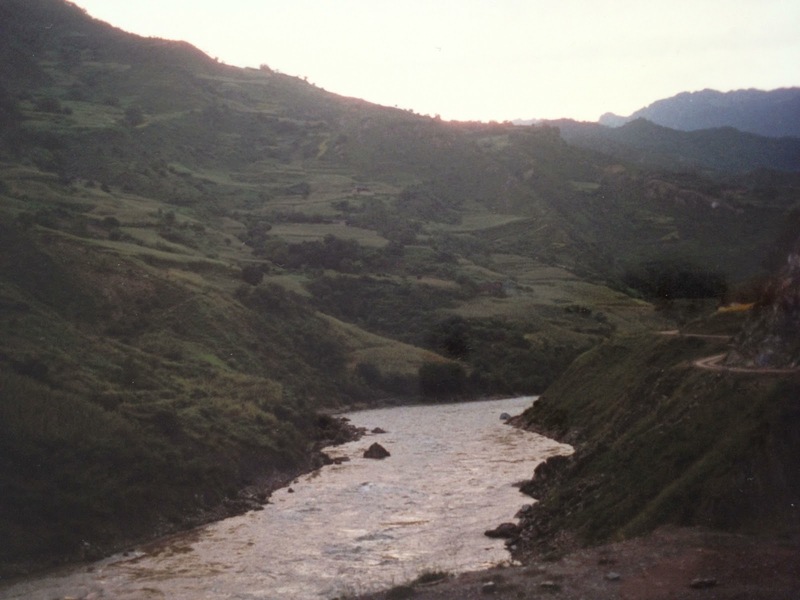 It is said the Kagyupa fled south after the rise of the Gelugpa in Tibet proper. What began with a tragic escape though could become a "market advantage" today: These monasteries are historically established outposts of Tibetan culture and perfectly positioned to introduce Tibetan Buddhism to the interested Chinese public. Moreover since they are institutionally less rigidly organized than their Gelug brothers in their huge monasteries, these Lamas are flexible to travel and teach the Dharma. Hopefully they can make the most of their situation to be good ambassadors of Tibetan culture and benefit the local people. As a child and also during adolescence I was always under the impression that there is a clear border with Tibet on one side and China on the other. But as it turned out, between our two countries' southeastern border was a whole ethnic potpourri of people like the Yi, the Moso, the Naxi, and again groups like the Lisu, all probably with their own understanding of who they are and where they belong. And I haven't even begun looking into the northeastern frontier. Do we do these groups justice when we map the places where they live as "Tibet"? Historically the Tibetans have looked down on the Tibeto-Burman groups along their border, considering themselves superior in civilization. But times have changed. Everyone is equal now and deserves respect. Are we inadvertently doing onto them what the Chinese are doing onto us? I also wonder how the textbooks used in the Tibetan-run schools in India today describe the multiethnic Tibetan periphery. School books are relevant in as much as they reflect the view of a government. These books influence children's perspective of how they perceive the world. So does the Tibetan leadership have a clear idea which areas and cities can be considered Tibetan today? What about the other ethnic groups who sometimes live in the same place? Where does Tibet stop and where does China begin? 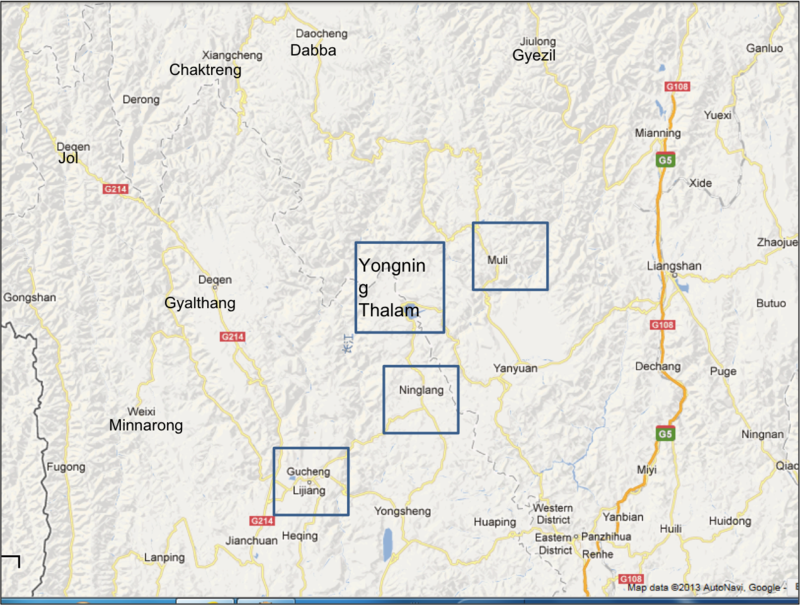 Extract of Google Maps: The southeastern Sino-Tibetan fronter travelled in late 1996: Ninglang- Mili - Thalam - Lijiang. My dad used to say the power of the Lhasa government ended at the Drichu, the upper reach of the Yangzi, which maps show in Chinese as Jinsha Jiang. He used to say it with a sense of pride: "The Tibetan areas east of the Drichu were free and ruled themselves!" If there was any authority they respected at all, it was their Lamas. But what sounded great to people like my dad is a curse today because at the Drichu is where the Chinese drew the line. All Tibetan areas to the east did not make it into the "Tibet Autonomous Region" and are now cut off and incorporated into the neighbouring Chinese provinces so that we have this irritating situation where a large part of Tibet is not Tibet. As a nation we paid dearly for historical Lhasan negligence and shortsighted Khampa pride. It's been a while since I've seen some of these places. A lot has changed in the meantime, I'm sure. But even a hundred years after Rock, Goullart, Kingdon Ward, Amundsen and whosoever, my fascination with this part of the Tibetan highlands endures. The next travel project is to explore the northeastern border up in Amdo. For the moment however, the only type of adventure I am experiencing is trying to solve unforeseen problems at the office and keeping up pace with the children at home. My daily routine is domesticated and predictable. But whenever I wear creoles, I tell you, a touch of real adventure is in the air and I fancy feeling a wild, non-conformist streak in me. Perhaps I was a Yi in a former lifetime, who had interactions with Tibetans, and then came back as one? Buddhist rebirth theory would explain the attraction to this corner of the highlands where Tibet has stopped to be totally Tibetan, but China has not yet properly begun.